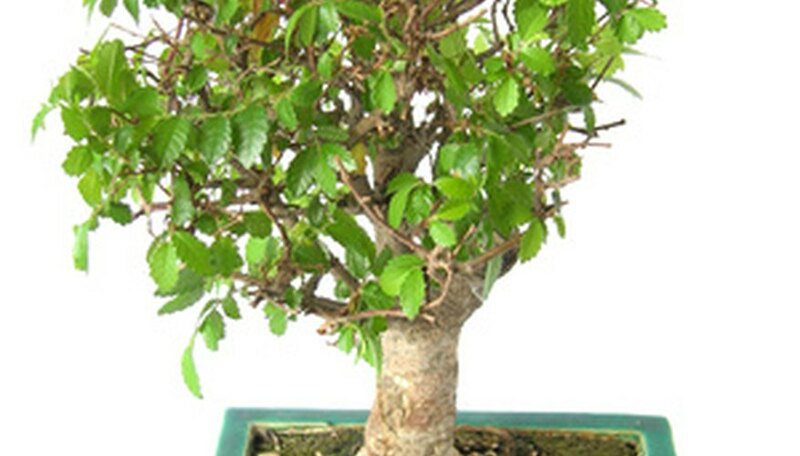 Similar to its full-sized counterparts, the miniature bonsai tree will react to adverse conditions. Poor establishment, over-watering and root-bound systems are just some of the conditions that cause the bonsai’s decline. Saving the bonsai involves refreshing its establishment, then allowing it time to repair itself. A combination of attentiveness and patience is the key. Place the bonsai on a clean table that is covered with newspaper or a disposable cloth. Inspect the bonsai thoroughly. Look for wilting, browning foliage, weakened branches, etc. Use sharp, sterile pruning scissors or shears to cut away any wilted or dying areas. Complete the cuts at an angle to promote rapid healing. Thin the interior foliage to promote increased air circulation and light penetration throughout the tree. Combine equal amounts of nutrient-rich potting soil, organic compost and clean, fine sand. Mix the combination thoroughly to create a well-balanced mixture. Set the mixture aside to use during repotting. Remove the bonsai tree from its potting container. Use your root hook or your fingers to gently remove the excessive soil from the root system. Prune away any dead or damaged roots from the root system. Use sharp, sterile scissors to complete the cuts. Trim the damaged roots away as close to the base of the system as possible. Repot the bonsai in a clean potting container that is just slightly larger than the previous one. Ensure that the container has a good drainage system. Apply mesh lining at the bottom of the container to keep soil from exiting the drainage holes while keeping bugs from entering. Line the bottom of the container with a layer of prepared soil. Center the bonsai tree in the container and fill the container with soil. Ensure that no roots are showing from the surface. Then, press the soil firmly around the base of the tree to secure its upright position. Place the newly repotted bonsai in the sink. Use a finely drained watering can filled with tepid water to irrigate the bonsai. Water the bonsai thoroughly until the water begins to flow evenly from the drainage system. Allow the bonsai to rest until the water flow stops. Protect the bonsai’s soil moisture levels. Apply a layer of clean stones or pebbles across the surface of the bonsai tree. Do not glue the stones as the adhesive chemicals can be harmful to the bonsai tree. Place the bonsai in a warm location that receives four to six hours of partially shaded to full sunlight each day. Avoid locations that receive intense afternoon sunlight to reduce the potential of foliage sunburn. Keep the bonsai tree away from sources of direct temperature variations, such as heating vents and air conditioners. Allow the bonsai time to re-establish and repair. Wait at least four to six weeks after repotting to fertilize the tree. Irrigate the tree deeply and infrequently to prevent over-watering. Check the soil’s moisture levels before watering the tree. Irrigate the tree only when the soil feels slightly dry. Never allow the bonsai to dry out completely.